Xiaofei Kang has a B.A. and M.A. in Chinese language and literature from Beijing University (1983 and 1987), a M.A in Asian Studies from University of California at Santa Barbara, and a Ph.D. in Chinese history from Columbia University (2000). She taught at St. Mary's College of Maryland and Carnegie Mellon University before she joined the faculty of George Washington University in fall 2010. She is the author of The Cult of the Fox: Power, Gender, and Popular Religion in Late Imperial and Modern China (Columbia University Press, 2006. Translated into Chinese by Yao Cheng-chih: Boya Publishing House, 2009; Zhejiang University Press, 2011). Her second book,Contesting the Yellow Dragon: Ethnicity, Religion and the State in the Sino-Tibetan Borderland (with Donald S. Sutton, Brill, 2016), wonChoice’s Most Outstanding Academic Title in 2016. 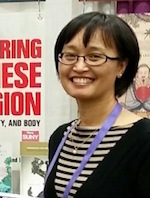 She is a co-editor of Gendering Chinese Religion: Subject, Identity and Body (with Jia Jinhua and Ping Yao, SUNY Press, 2014,), and is now working on gender, religion and the twentieth-century Communist revolution in China.